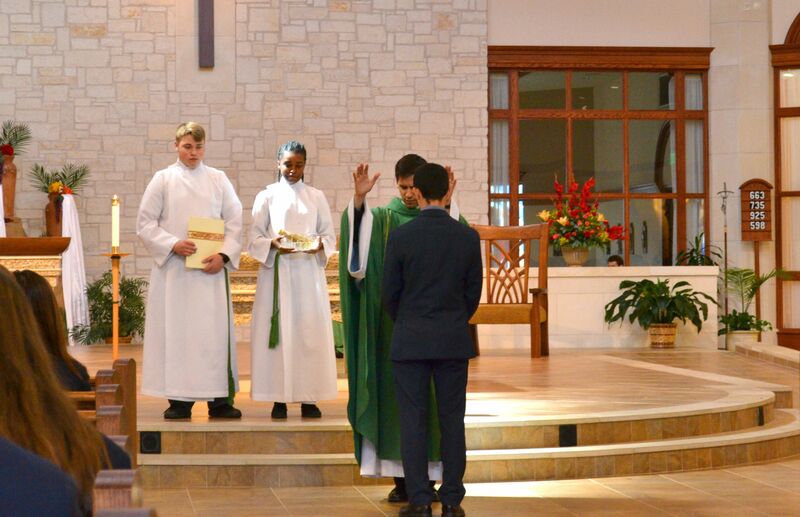 A St. Dominic Savio Catholic High School senior, Jose-Miguel Guevara-Hernandez was recognized at Mass on Wednesday, May 24th for his acceptance into the Undergraduate Seminary for the Congregation of Holy Cross. Jose-Miguel received a special blessing from a priest from the Congregation of Holy Cross, Fr. Dennis Strach, CSC, who currently serves as the parochial vicar of St. Ignatius Martyr Catholic Church. 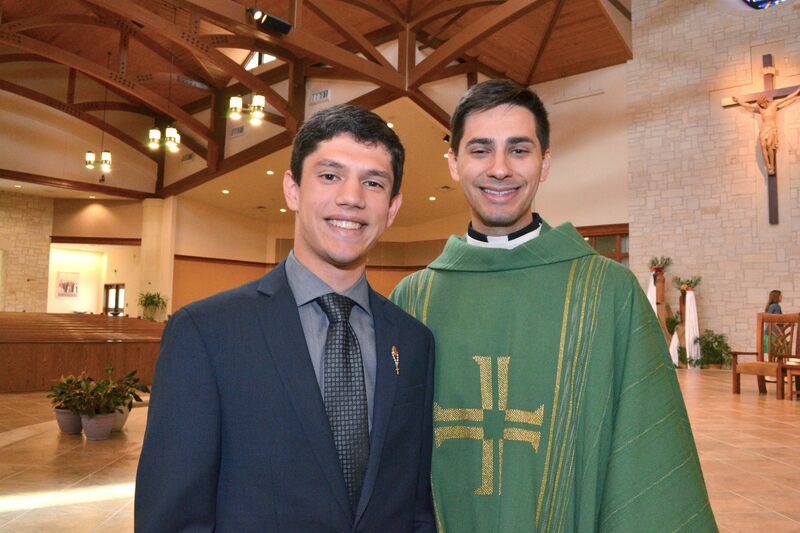 Please keep Jose-Miguel in your prayers as he makes preparations to begin his studies for the priesthood in the fall. To learn more about the Congregation of Holy Cross, visit their website. 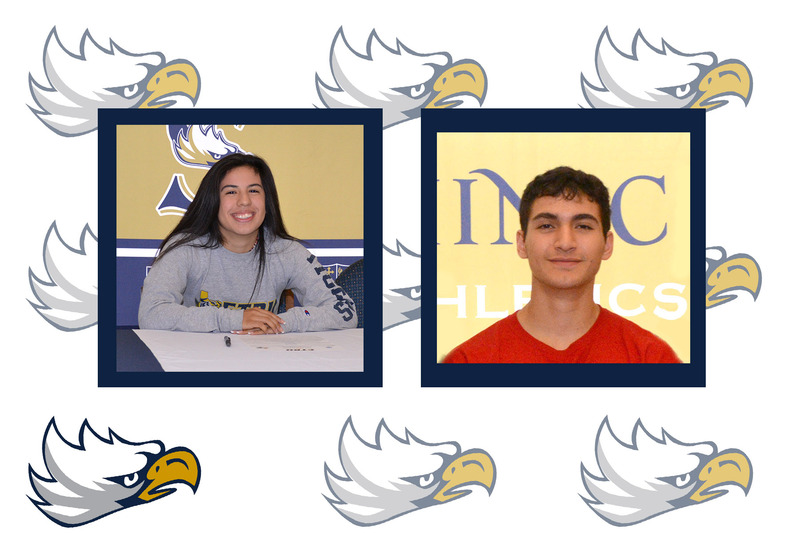 This week, two Savio students signed Letters of Intent to run track next year for two different Universities. 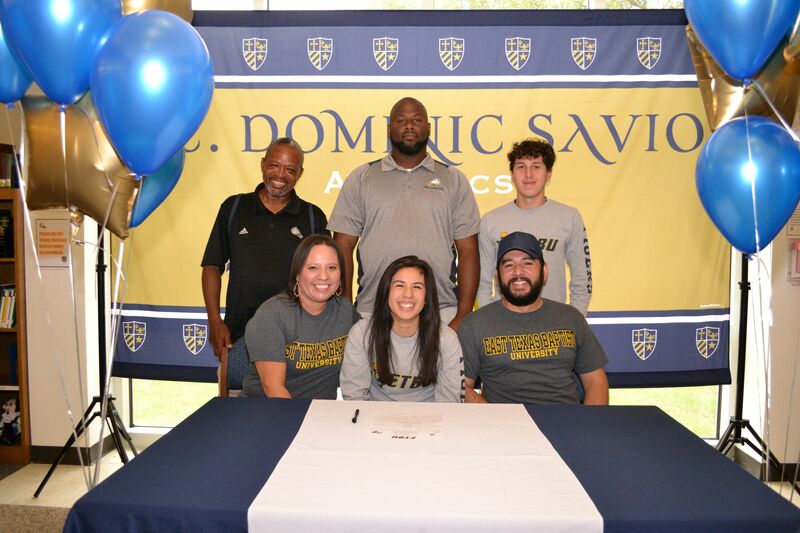 Arriana Islas officially signed a Letter of Intent with East Texas Baptist University in Dallas to run track next year. 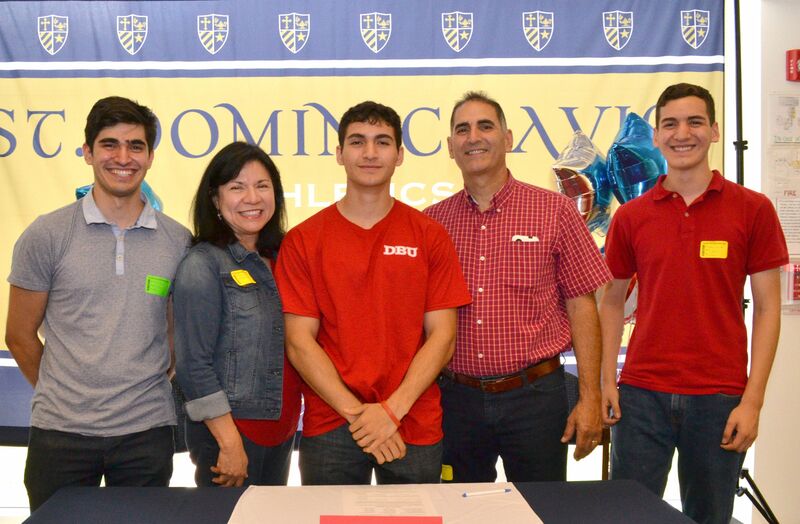 Elias Sanchez signed a Letter of Intent with Dallas Baptist University to run track in the 2018-2019 school year. 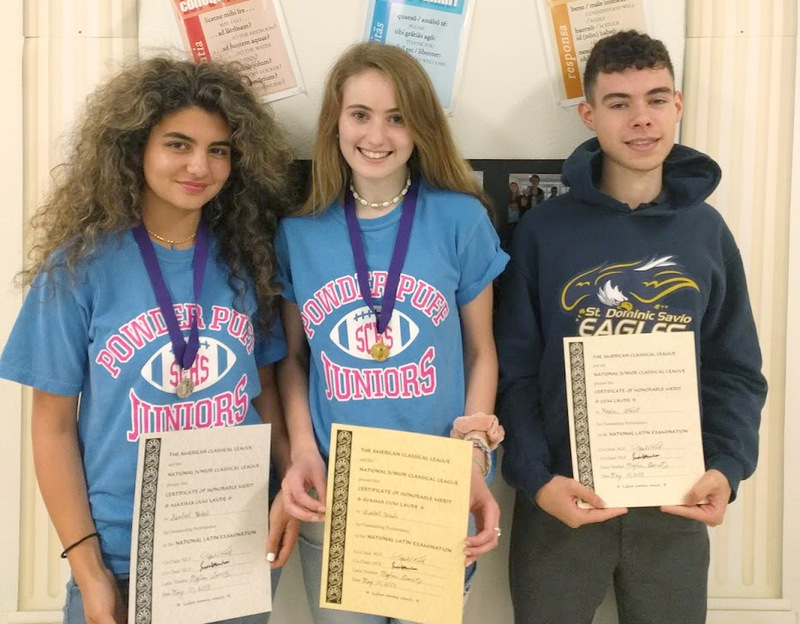 The faculty and staff at St. Dominic Savio are proud of both Arriana and Elias, they have worked hard for four years and it is an honor to have two students representing the school through both Track programs. 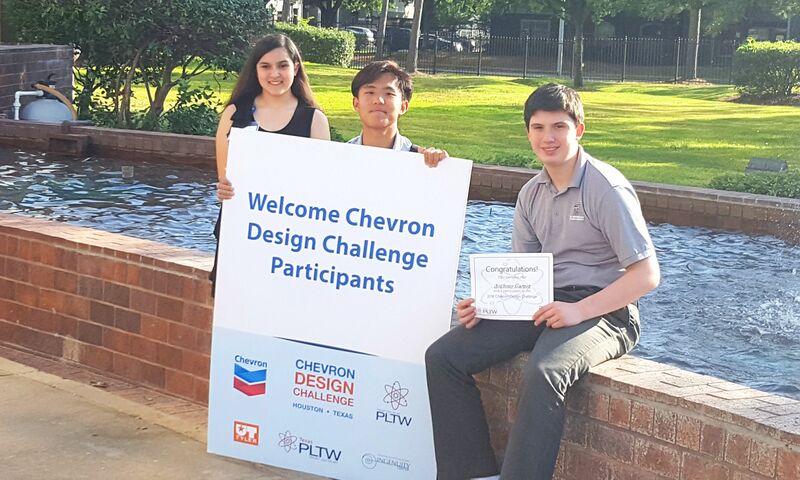 On May 19, 2018, three Savio Project Lead The Way (PLTW) Engineering students, competed in the 2018 Project Lead The Way Chevron Design Challenge in Houston. The three students that participated as a team of three, were Barry Fang, Anthony Garner, and Gabrielle Muniz. They work together as the Savio Inventors team. 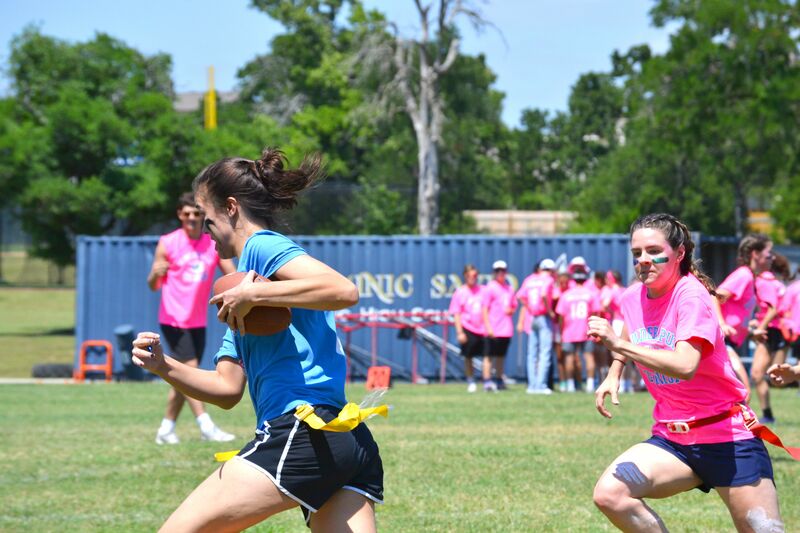 A total of 45 teams from Texas participated in the challenge at UT Tyler. In order to participate, students were required to be currently enrolled in the PLTW Introduction to Engineering (IED) or have completed PLTW IED. In the contest, each team was given a design brief in the morning and worked collaboratively and tirelessly throughout the entire day to create an original design that met the design specifications. Teams used Autodesk Inventor software to design parts, assemblies, drawings, and animated presentations. At the end of the day, all teams presented their original designs to Chevron judges, PLTW and UT-Tyler representatives, friends, and families. The top four winning teams won large prizes, that included PlayStation 4 consoles! The Savio Inventors thoroughly enjoyed the challenge, learning about engineering careers and networking with the representatives from Chevron, UT-Tyler and PLTW! They look forward to attending again next year and taking more Savio classmates! 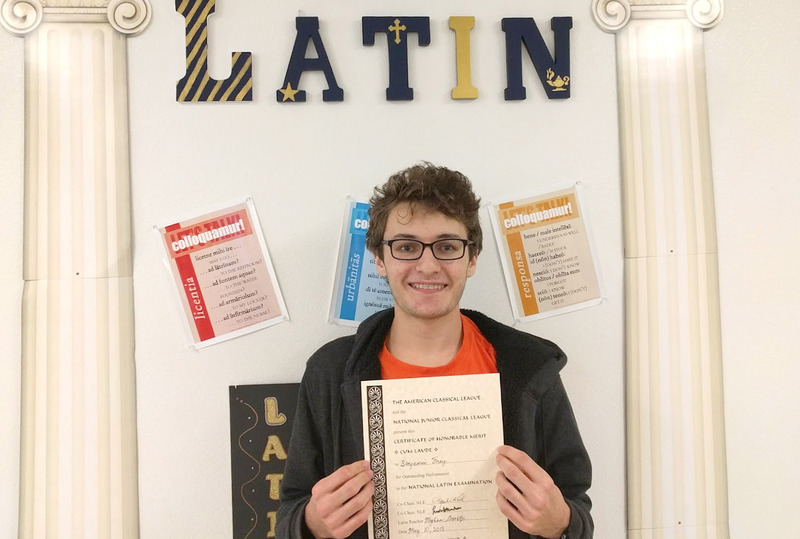 This year, 26 students participated in the National Latin Exam. Out of the 26 Savio students that participated, 10 students received recognition for receiving scores above the national average. 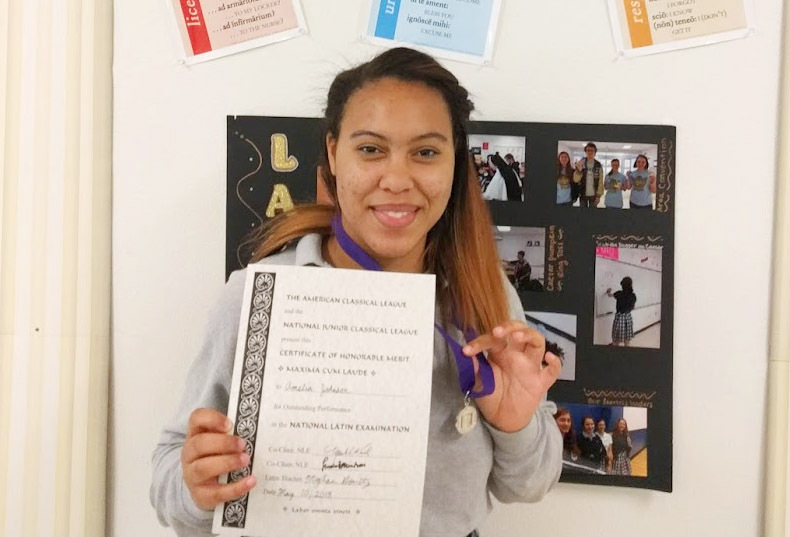 The National Latin Exam sent the 10 students a certificate and four students a medal to highlight their achievement. 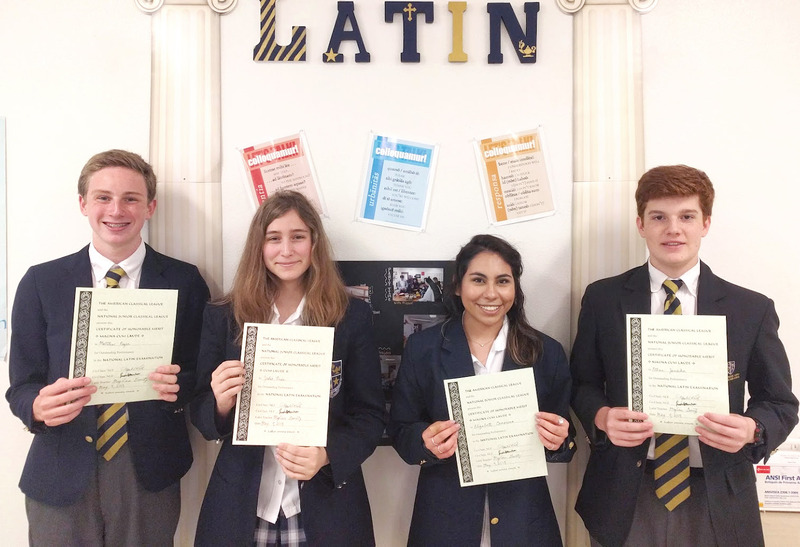 “Over a third of our students displayed knowledge and skill in Latin, higher than the national average. 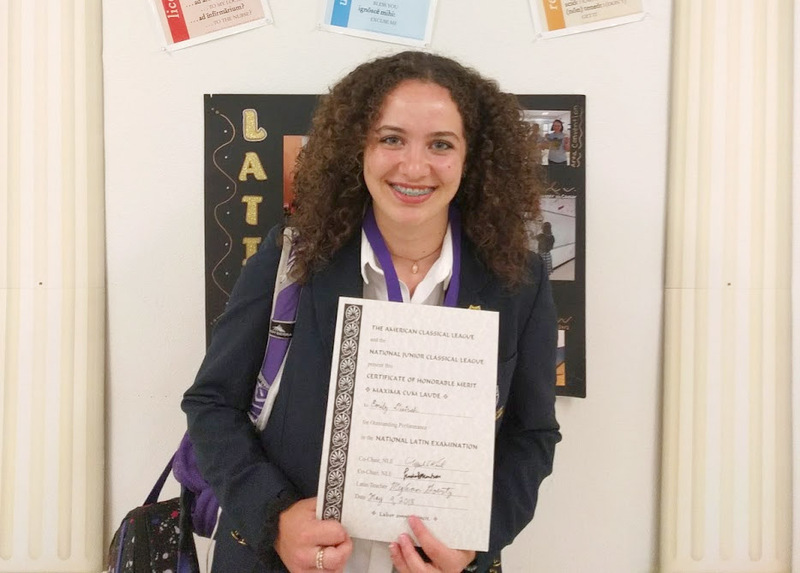 I'm so proud of our many exceptional Latin scholars!” said the Savio Latin Teacher, Mrs. Meghan Goertz. Every year, there are over 150,000 Latin students across the country that participate in the exam. The National Latin Exam is sponsored by both the American Classical League and the National Junior Classical League. The exam is a 40 question multiple choice test with a time limit of 45 minutes. Below, are the list of 10 Latin students that received recognition for receiving a high score on the Latin exam, listed by class. 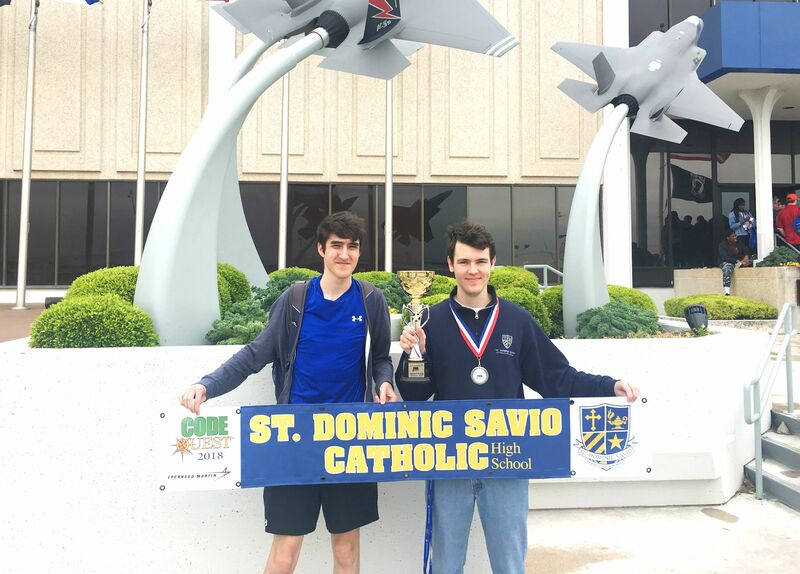 St. Dominic Savio’s “Iron Eagles” Robotics teams finished their season with a flourish on Saturday, May 12, at the first annual TAPPS State Robotics Championship, held at the Waco Convention Center. 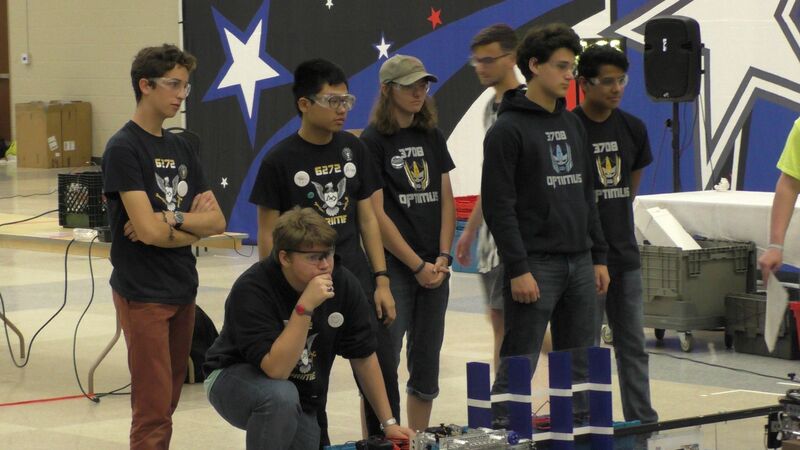 After posting a 5-1 record during qualifying rounds, Team “Prime” finished the competition ranked in 2nd place, and then chose their sister team “Optimus” to compete with them in the final elimination rounds of the tournament. The “Optimus/Prime” alliance then narrowly won their semifinal matches 2-0 before losing in the finals to the strong #1 alliance, made up of World Championship finalist Reicher Robotics from Waco and Austin’s own Saber Robotics from St. Gabriel Catholic School. At the season-ending awards ceremony, Prime was also honored to win the “Strategic Thinking” award, and both Prime and Optimus were nominated for two other awards. 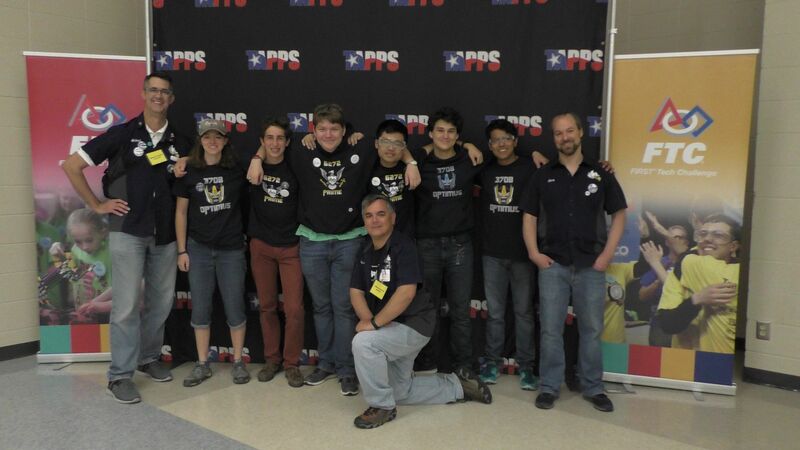 Congratulations to both teams for a great finish to another successful robotics season! 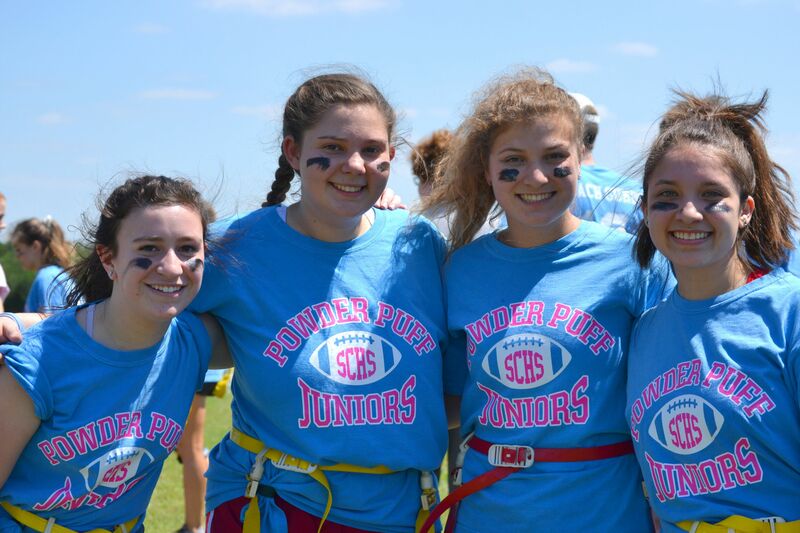 On Thursday, May 10, Juniors and Seniors took a break from exams and classes for a game of flag football. 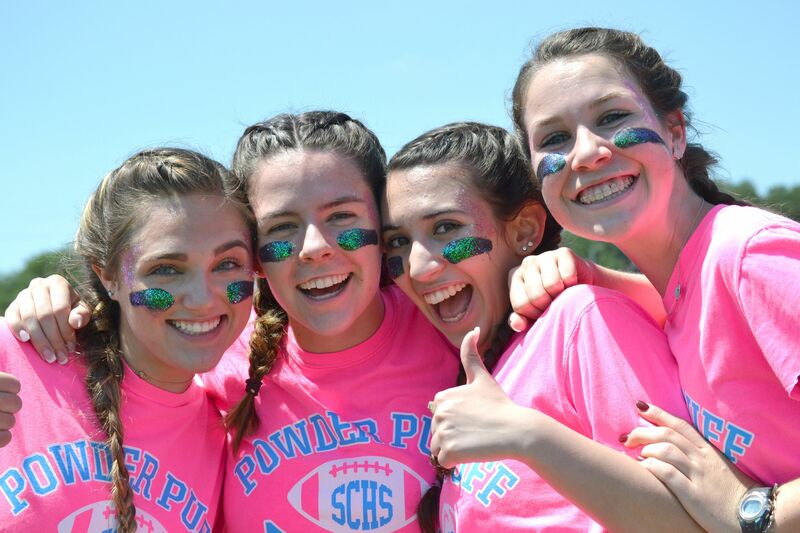 The Senior and Junior girls played against each other in flag football, as competitive cheers could be heard. The Senior and junior boys stood by and coached the girls. The game ended in overtime 0-0. The boys took over and extended the game in overtime that still resulted in a 0-0 score. Fun was had by all students and faculty that were present! Please join us in celebrating Mr. Daniels and his service at St. Dominic Savio Catholic High School for the last seven years as a teacher and principal. All are welcome to attend a reception on Sunday, May 20, 2018 at the St. Vincent de Paul Catholic Church Parish Activity Center after the 9:30 AM Mass. St. Dominic Savio has a new Assistant Principal that will begin his role next school year, 2018-2019. Mr. Patrick Goertz has been named as the Assistant Principal for Curriculum and Instruction. 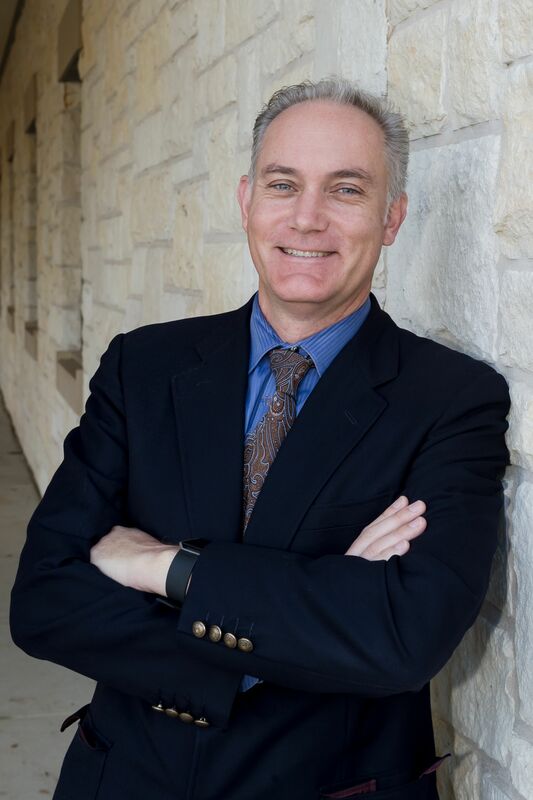 Mr. Goertz holds two degrees from the University of Texas including a Bachelor of Science degree in Cell and Molecular Biology and a Master of Arts in Science Education, with an emphasis in STEM. Mr. Goertz has 12 years of teaching experience that began in public schools, before teaching at St. Michael's Catholic Academy and St. Dominic Savio. He has been teaching at Savio for the past six years, and currently serves as the Chair of the Science Department. 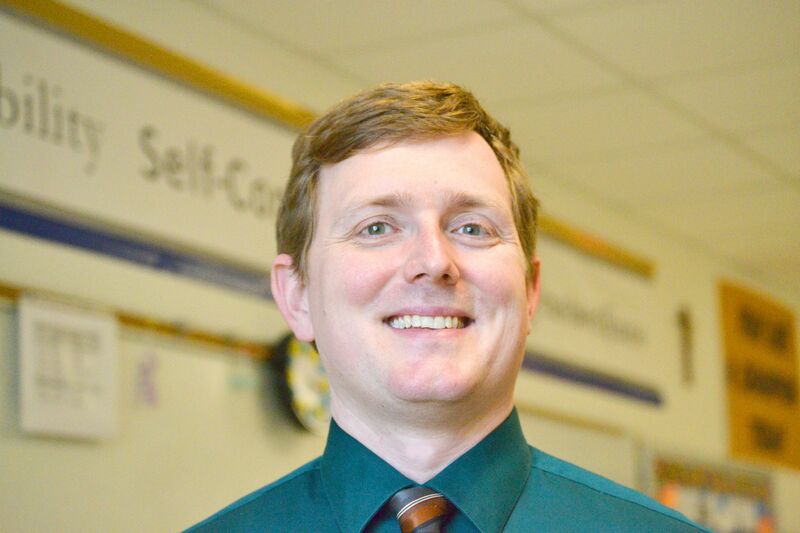 Mr. Goertz will work with the Principal to support the development of a strong college-preparatory curriculum through collaboration and training of faculty, relating to curriculum and instruction. We look forward to working with Mr. Goertz in this new capacity. Savio Boys assist with roof repairs after Hurricane Harvey. When the school year began, it was a desire for the Christian Outreach class to travel to the coast to assist with Hurricane Harvey relief. The Christian Outreach class reached out to Saint Helena of the True Cross of Jesus Catholic Church in Corpus Christi, Texas, to inquire where they may assist with clearing damage from Hurricane Harvey and where help might be needed most. They were connected with Deacon Richard Longoria, who has coordinated various youth groups to assist with service work in the area. About two weeks before the Christian Outreach class were supposed to leave, Deacon Richard asked the group if they could assist the towns of Tivoli and Austwell instead, because the Mayor of Austwell, Mary Canales, reached out to Deacon to ask for help. The Christian Outreach class made plans to travel Friday, April 6 – Saturday, April 7 to the town of Tivoli, Texas. Savio Girls assist with nail removal from a home. “The city of Tivoli has suffered damages from Hurricane Harvey and is still recovering, so we went to help with the recovery efforts. We helped in various ways. 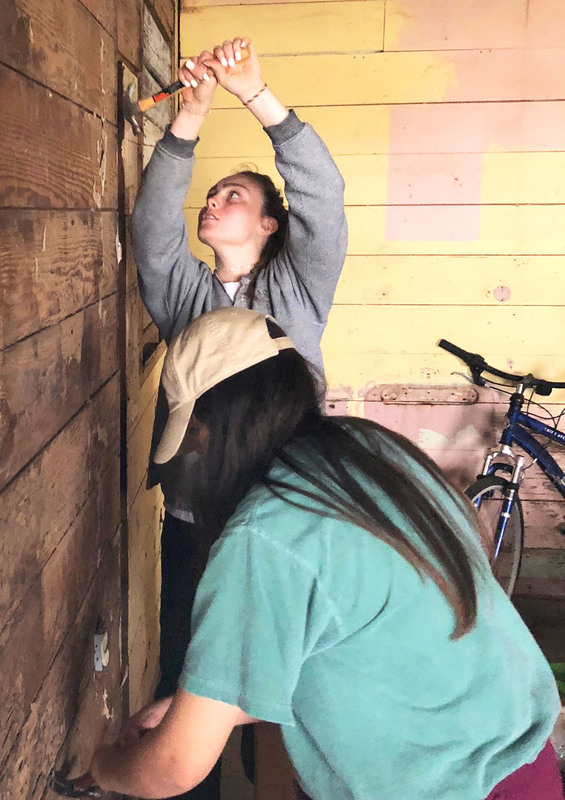 The girls worked on smaller projects with moving brush, clearing out rooms and removing nails from someone's home. 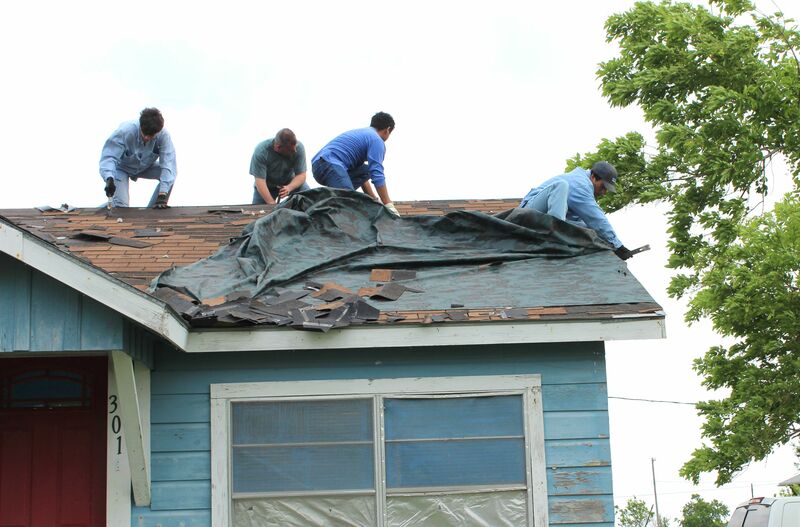 The boys worked on the roof removing shingles.” Savio senior, Maya Saucedo said. The students felt called to assist with the small towns of Tivoli and Austwell. “In the beginning, it seemed like we were doing small projects that were not going to make a big impact, but one of the most important lessons we learned, was that we needed to go wherever God was calling us to go. We may not understand why we are called to do certain things, but God calls us where he knows we are needed,” Maya added. Through this experience, the students found they could have an impact and make a difference, by joyfully serving those who are in a vulnerable situation. “This service opportunity taught us much patience and humility. It was so eye opening to see a city that has had barely any attention after the hurricane and how much destruction the town still had. People were living in tents because their houses were torn down, hundreds of fallen trees were all around the town, and so much more. Through the Holy Spirit, we found the joy and strength to do whatever these sweet people of Austwell needed in their town,” said Savio senior, Peyton Kilburn. “If there is one thing I would like the Savio community to know about this trip, it would be the importance of serving the poor and vulnerable. God calls us to serve the least among us and those who are most vulnerable. The people of the city of Tivoli were so thankful for our work because they were left vulnerable after the hurricane and had felt neglected because they are a smaller city, so not a lot of people came to help them,” Maya said. Most of the students in the Christian Outreach class are graduating in May, but they have plans to return to the Tivoli and Austwell area at the end of June, to continue to assist with recovery. The Austin-American Statesman has also reported on this story. St. Dominic Savio Catholic High School is located in Northwest Austin, Texas (9300 Neenah Avenue, Austin, TX 78717), in an active and thriving community. St. Dominic Savio is a college preparatory school and was founded by the Diocese of Austin in 2009 to prepare young men and women to become faith-filled, visionary and inspirational leaders in service to the Church and the world. 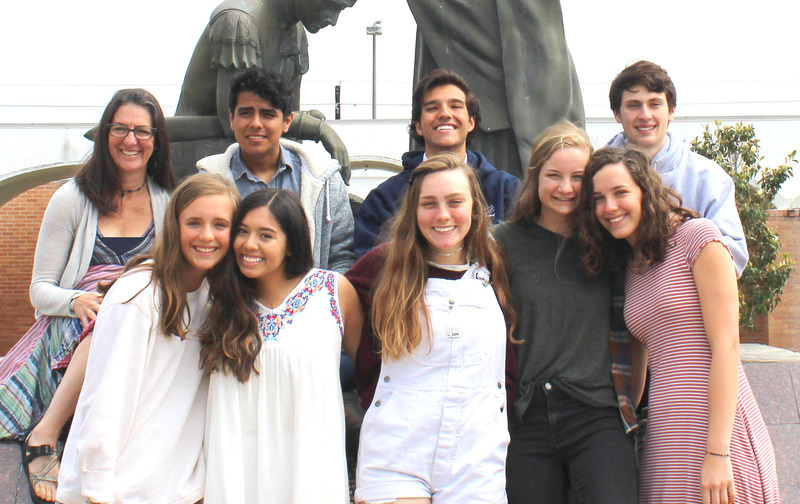 St. Dominic Savio seeks to build a strong community of faith supporting the mission of the school forming well rounded, visionary leaders for the Church and the world. St Dominic Savio offers a faith experience that will encourage all students to reach their full potential as caring, conscientious, and moral servant leaders. The vision is "Forming Servant Leaders in the Image of Christ." Please contact the school President, Dr. Joan Wagner, or the Director of Communications, Mrs. Cristina Almanza at 512-244-4811 or by email calmanza@saviochs.org. The Christian Outreach class is pictured with Mrs. Katie Artzt, the Christian Outreach teacher. Our competitive programming team ended 2018 with several great performances in a few enormous meets. Juniors Brandon Boettcher and Jonathan Shoemaker traveled around the state to compete. First came the UT Dallas, Battle of the Brains, on April 7th. This tournament is generally thought to offer the toughest problems of any tournament, Savio was in the lead most of the day, only to get sniped at the end while winning the 2nd place trophy. 117 total teams competed, including all the top Texas teams. Savio lost out to Plano West, but beat many of the top 6A schools in the state. Next up was the Lockheed-Martin Codequest. This tournament was held simultaneously at 18 international locations. Over 1500 students competed in what is generally considered the biggest single tournament of the year. Teams had to solve 19 problems in two and half hours. Among all ~600 teams, only four managed to run the table and Savio was one of those four. The tiebreaker came down to incorrect submissions, and Savio had 3 compared to Richardson High School's 2, so we earned the second place trophy at the Fort Worth facility. 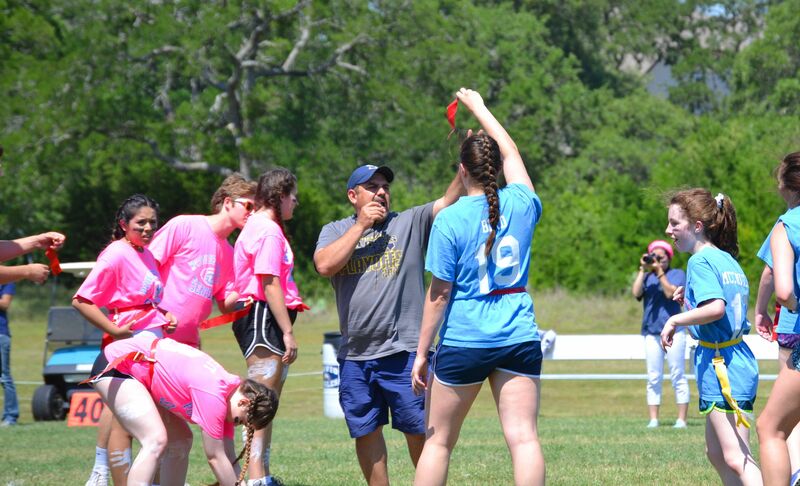 However, Savio is receiving an additional award for being one of the top teams in this region of the country. The tournament itself provided a lot of free Lockheed-Martin gear, and the teams were given an impressive tour of the F-35 fighters being built in Fort Worth. Finally, junior Jonathan Shoemaker was named a USACO finalist. 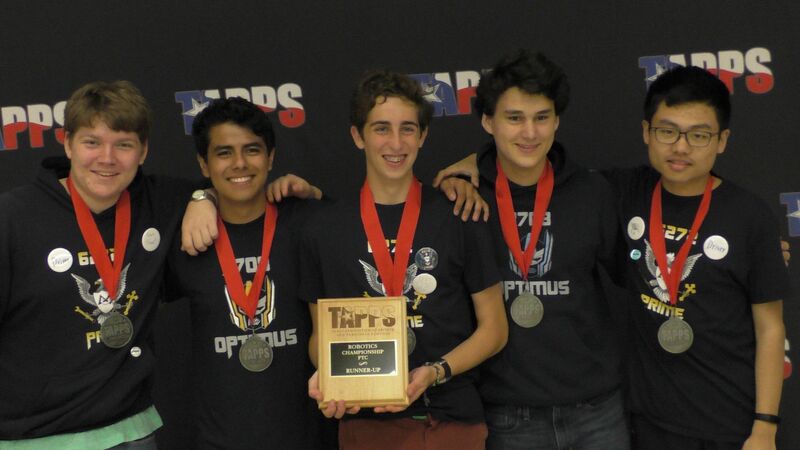 USACO (USA Computing Olympiad) is one of five big academic Olympiads, in which students compete to represent the United States at an International Olympiad competition held in a different location every year. Only the top four high school students get to represent the country, with every major country (over 80) sending a team to the competition. The United States generally finishes among the top few teams. Each year the top 26 high school students are identified as USACO finalists through a series of competitions, and earn a free trip to the USACO training camp held at Clemson University. 14 students (called Guernseys) attend a series of lectures given by various professors on advanced techniques. 12 students (called Holsteins) are considered in contention for the top 4 spots. Last year Jonathan attended as a Guernsey, but this year he comes in with the #7 Holstein ranking hoping to crack the top 4. All scores from the year are erased, and students compete in seven consecutive days of five hour tournaments to determine the top 4, starting on May 24. This year's International Tournament (IOI) will be held in Tokyo while next year's will be in Azerbaijan. This ends a great year of Savio Programming! Savio is looking for the next great team to emerge, if you are interested to join the team, please contact Savio parent, Dr. David Shoemaker, drshoema@alum.mit.edu. 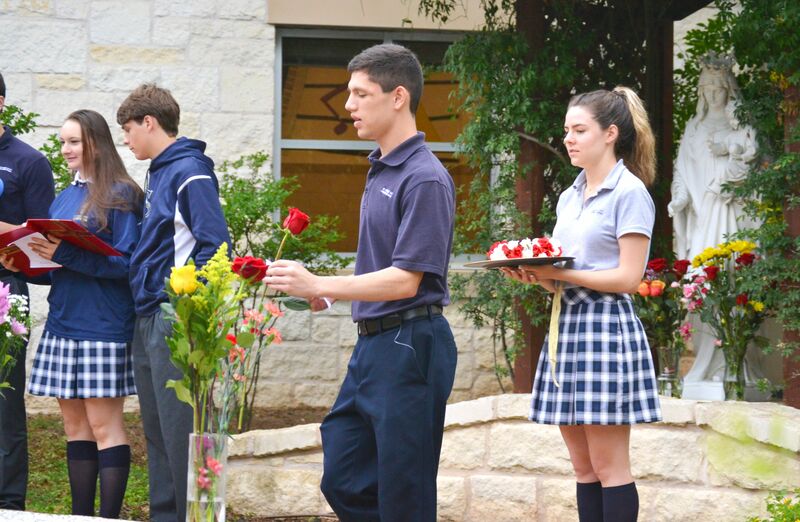 On May 1st, Savio students gathered in the courtyard and prayer garden, to honor the Mother of Jesus. 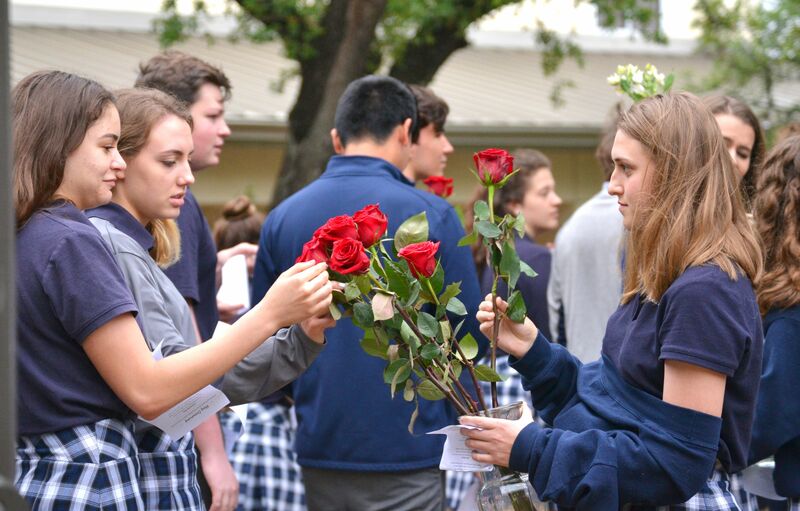 The students passed out flowers to encourage more students to participate. 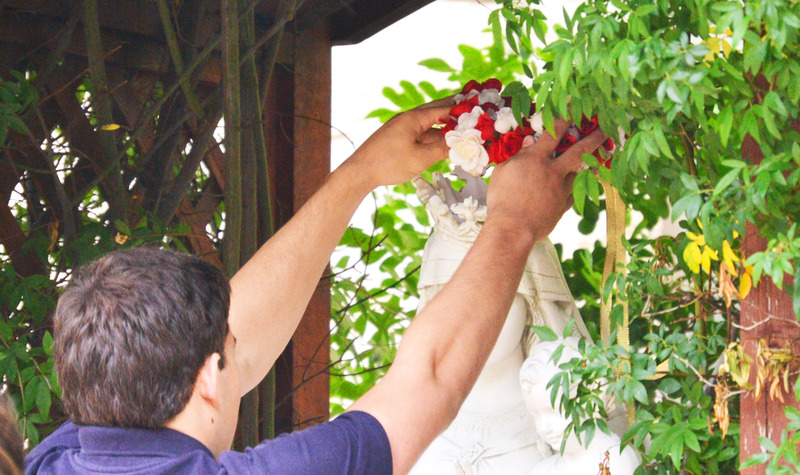 The visible offering of a flower to the feet of Mary, is a visible offering to show the internal prayer offering that the students bring to Jesus through Mary, the mother of God.